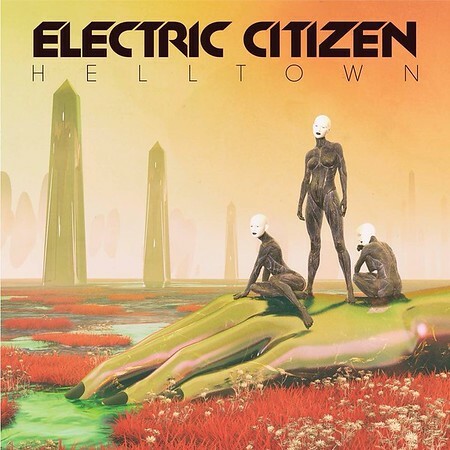 “Helltown” is the third album from Cincinnati band Electric Citizen and it was released on 28th September by RidingEasy Records. Electric Citizen are a rock outfit built around a husband and wife team and features the amazing vocals of Laura Dolan. They’ve been labelled as stoner, psychedelic or doom metal. I’d posted a recommendation for their previous album in 2016 and I should have a track from the new album on the Friday NI Rocks Show next week! Electric Citizen formed in 2013 and released a self-titled EP that same year. That was followed by the debut album “Sateen” in 2014 and then “Higher Time” in 2016. The latter was a bit of a change of direction but the album was well-received. However, “Helltown” shifts the sound back toward that on the first album. The release of “Helltown” also marks a return to the original line-up as bass player Nick Vogelphol rejoins singer Laura Dolan, guitarist Ross Dolan and drummer Nate Wagner.